Lewis Hamilton (1st, 1:23.949): "It was really good fun out there today. I'm starting to think this might be my favourite track. It's so fun to drive with the combination of corners and undulations. The way it all flows together just feels old school. It's incredibly hot, though - like driving in a sauna! You're drenched in sweat before you even get in the car with all the thermals on and I lost about half a kilo just in that session. It's a big challenge to get a good lap here in these conditions and I think everyone has struggled a bit. It's meant to be a bit cooler on Sunday which will be easier to cope with physically but will obviously change the balance a bit, so it should be interesting. Our car feels strong here though and I'm very happy with it so far." Nico Rosberg (4th, 1:24.668): "Today was a difficult day for me. I didn't ever really find the right balance, moving from oversteer to understeer. The long run pace was okay, so I can build on that. But I definitely have some work to do to improve my setup before tomorrow morning and get some practice in for qualifying during P3. It's really hot out there. In the car you are sitting almost on the asphalt, so you can feel the heat very much. It will be a demanding race on Sunday." Paddy Lowe: "A good start to the weekend. It's been very hot during P2 - both for the drivers and the crew - but was a little cooler during P1, which we suspect will be more representative of temperatures during the race on Sunday. The morning session was interrupted by two red flags which meant we couldn't quite do as much as we wanted to, while the afternoon session saw a full programme completed. It seems everyone is finding it tough to put together a complete flying lap, so it should make for an interesting qualifying session tomorrow." Daniil Kvyat (2nd, 1:24.300): "It was a good day for us today, the car performed well, however it's only Friday and we have to keep pushing so that we turn that into a good result in qualifying tomorrow. Both our cars looked competitive, straight-line speed is less important here and that suits us. It's a tough weekend for all the drivers, Jules is on all our minds, and we are all affected." Daniel Ricciardo (3rd, 1:24.451): "The car felt good today. The balance is better and it's an easier car to drive than in recent races. We didn't make any big changes, just a few minor things that seem to be working well. This track suits us, as it's less of a power circuit. It's quite a bumpy track but we seem to be doing okay. We were using an old engine so we won't have any penalties for that. It's been an emotional week for all of us drivers; it's important to race well for Jules this weekend." Valtteri Bottas (9th, 1:25.881): "It has been a good day; we ticked off all points on our checklist including a back-to-back comparison of the new components. The new front wing has given a small improvement but we will look at the data to be completely sure. The heat is always an issue but it's the same for everyone, however I quite like saunas!" Felipe Massa (10th, 1:25.920): "The way the day has panned out it is clear we have the potential to have a good weekend and fight with those closest to us in the championship. It won't be easy but we have more to give than was shown today. The temperatures will be cooler for Sunday which should help us control the tyre temperature a bit better. Valtteri had a lot of work focusing on the front wing and it looks as though it is an improvement which is good for the rest of the season." Rob Smedley, Head of Performance Engineering: "It was a reasonably good day. We brought some new components in a constant bid to improve our package which seem to have worked from what we have seen so far. It has been extremely hot today and the car looks competitive on short and long runs with both low and high fuel which is encouraging. We now must focus on making sure all the details are correct, but we are heading in the right direction." 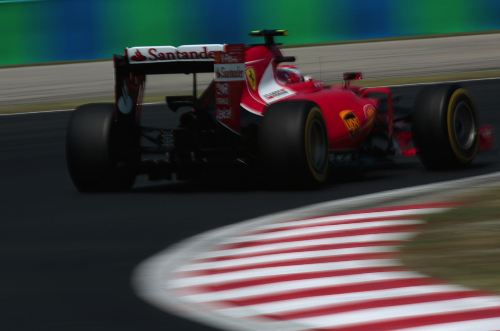 Kimi Raikkonen (5th, 1:25.134): "It was not a very clean day, in fact it was a slightly different Friday than normal. We had some issues and missed some running, but we were more or less able to follow our program. The feeling with the car was not too bad and the tyres were behaving pretty ok, but the laptimes are still not right. I don't know exactly what happened with my front wing, it just broke suddenly and came off damaging the tyre. The team is looking into it and hopefully they will find out the reason. Today it was only Friday, we had been trying many different things to see where we are. I think we can improve for tomorrow and find a bit more speed for the rest of the weekend." Sebastian Vettel (7th, 1:25.660): "Well, all in all we didn't have the best day. There were two or three things that slowed us down and cost us some time. We were stuck in the garage this morning with a shortage in the electric system, and this afternoon Kimi had a problem with the front wing, so we both couldn't run as much as we wanted. Now there is a lot to clean up, but for tomorrow we should do well and have a decent qualifying. Concerning Red Bulls performance, it was a bit expected but it is Friday and you don't know what people are doing with their fuel loads, still you could see already in Silverstone that they did a step forward. We didn't get into the rhythm today, now we need to sort out things for tomorrow, then we should have a much smoother weekend." Fernando Alonso (8th, 1:25.752): "We see on Fridays that some teams don't show their full potential, and are more competitive on Saturday. Neither Force India ran this afternoon, so I think it's realistic to expect that there'll be a few more cars ahead of us tomorrow. Nevertheless, I'm pretty happy with the performance of the car - it gets better every weekend. It's been a trouble-free day - we had no issues on either car - but now we need to focus mainly on the race. Our long-run pace looks okay, but qualifying will be important too because overtaking around here is so difficult. I'd like to hope that, if we finish the race, we can hopefully score some points." Jenson Button (12th, 1:25.994): "I enjoyed the car today - it was fun to drive - and the last time if felt like this was in Monaco, so that's a promising way to start the grand prix weekend. Hopefully, we can have a reasonable time here - it's tough with these high temperatures, but every team has to deal with that. Our high-fuel runs were reasonably positive today, so I think we've got a good foundation beneath us. The balance is giving me confidence: we know we can make it faster too, so, with a few little set-up tweaks, I think we could be in reasonable shape tomorrow. Overall, I think the team is in a good place - we've had a tough few races recently, but we've stuck together, and we've stayed strong." Eric Boullier, Racing Director: "Today's practice sessions were far from the jejune affairs we've seen recently; the drivers and engineers had to contend with a number of red flag stoppages, which, coming so close to the end of each session, had quite an impact on our scheduled run programmes today. Nonetheless, we made progress throughout the day, and it stoutens the spirit to end a practice session hearing both drivers proclaim that their cars are well balanced and inspire confidence. Of course, it's still too early to get an accurate read on our performance relative to that of our rivals - not least because neither Force India driver set representative times this afternoon - but we've made a positive start to our weekend, and we'll be looking to capitalise on that on both Saturday and Sunday." Yasuhisa Arai, Honda: "By running both FP1 and FP2 sessions smoothly, we were able to establish a precise energy management strategy suited to the track. In fact, our pre-race data simulation had been right on track. During FP1, the temperature and conditions were similar to Sunday's forecast for the race, so we used the session to work on power unit set-up. FP2 in the afternoon was held under intense heat, but the ERS settings were not at all affected by the temperatures, so we were able to do a qualifying simulation. All in all, it was a good day for us." Sergio Perez (19th, No Time): "It was a very positive session up until the accident. We managed to get a good read on the balance and made some useful set-up changes that took us in the right direction. Unfortunately we had the failure on the rear suspension, which ended our day early. It has cost us a lot of track time, but hopefully we can recover tomorrow to minimise the impact it will have on our final result this weekend. I still believe we can have a strong qualifying session so I'm optimistic for the rest of the weekend." Nico Hulkenberg (20th, No Time): "It's difficult to say much following such a short day. I felt the car was working quite well, but my first run wasn't particularly smooth and my second run was brought to an end with the red flag. It means we will have a bit more work to do in the morning and we will be limited on data. Hopefully the team can find a solution to the issue on Sergio's car." Otmar Szafnauer, Chief Operating Officer: "It's been a challenging day as we try to understand the right rear suspension failure on Sergio's car. The accident cut short our morning and we opted to withdraw from the afternoon session as a precaution until we had a clear understanding of the problem. Those investigations remain ongoing and will continue this evening to ensure we can resume running on Saturday. Up until the accident, the morning had looked quite promising for both drivers. We had some aero measurement devices fitted to the cars and carried out some work with the medium tyres. Losing the afternoon puts us on the back foot, but I'm optimistic we can recover some of the lost ground tomorrow to be ready for qualifying." Carlos Sainz (6th, 1:25.599): "Not the easiest of starts to a race weekend, I think everyone had a few difficulties out there due to the high track temperatures. I struggled a bit with rear-tyre overheating, but we were able to work around this and at the end of the day we can say we have a decent baseline to build on during the weekend here in Budapest. I really enjoy driving here. I like the many corners and the stop-and-go nature of this circuit. Obviously in an F1 car the track feels a bit smaller and tighter, but this just makes it more challenging and that's what I like." Max Verstappen (11th, 1:25.935): "We started the day off well, taking it easy, learning the track and setting-up the car. It was quite a good first session, we were able to try a few different things on the car and we knew in what direction we wanted to go. In the afternoon my first run wasn't perfect...it was so hot out there! And then, in the in-lap, I suddenly started to feel something was wrong with the car. Unfortunately this was due to an electrical problem which cost me quite a lot of FP2 track time. I was able to get out on track again but it wasn't for long, as the session was red-flagged... So not the best of afternoons for a rookie." Phil Charles, Chief Race Engineer: "All in all, it's been a useful first day for us here in Hungary. Max unfortunately had an electrical problem in FP2, which knocked him back a bit. However, a part from this scrappy afternoon for him, it's not been a bad day. He had a productive morning and he will get better tomorrow. Carlos has had a good day. He was able to work through his program and has done a good job. He's happy with the car and that's a good sign going into tomorrow. Our main focus once again is on the tyres. The track temperatures here today have been very high, so dealing with this has been tricky. Both drivers have had rear-tyre overheating, so it will be key to work on this overnight in order to manage it in the best way possible during the rest of the weekend. I'd like to add the fact that our sister car, Red Bull, is looking very strong - they seem to have made a big step forward. This is a good indicator that we should also be able to do well here, so we just need to make sure we optimise everything to achieve a good result this weekend." Pastor Maldonado (13th, 1:26.090): "For sure it was something of a mixed up day, but it was good to get some decent laps in the afternoon and make some progress with the set-up of the car. The Hungaroring is always a challenging circuit and I think there's more to come from us this weekend. At certain times during the afternoon session we looked pretty competitive, but you never know anyone else's programme. Tomorrow will be interesting, especially as qualifying position is so important here." Romain Grosjean (15th, 1:26.442): "It was a reasonably straight-forward FP2 for me and even though we didn't end the session where we'd like to be on the timesheets, there's decent pace in the car and it feels pretty handy around the Hungaroring. There were hot conditions this afternoon which obviously has implications for tyre performance and is something we'll be looking at for qualifying and the race. I'm pretty sure we'll be quicker tomorrow." Jolyon Palmer: "That wasn't the fullest FP1 session I've participated in and of course it was frustrating to be all ready to go but these things happen. I think the team is reasonably well placed for the weekend and the car looked quite good on track during the afternoon. It's very hot here in Budapest so that could mix things up a bit tomorrow in qualifying and on Sunday for the race." Alan Permane, Chief Race Engineer: "This afternoon we were able to complete extensive run programmes with both Pastor and Romain which meant that the limited running in the morning was not as much of an issue as otherwise. It was unfortunate that Jolyon didn't get many laps in the morning, but he did everything he could in the circumstances. We have some work yet to do on set-up but there's good scope for improvement." Roberto Merhi (17th, 1:29.113): "I only completed FP2 today but I am feeling positive for the weekend. At first I wasn't comfortable with the settings, but the team made the changes and I was much happier. The qualification simulation was good but I made a few mistakes, so there is more to come. The long run is normally strong for us, but today was not so strong as I couldn't get the best out of the tyres. Hopefully the track will be cooler on Sunday and I can show more of our true long run pace. " Will Stevens (18th, 1:29.115): "Overall, today has been a good day and I'm pretty pleased. We have gathered a lot of information which we'll work through overnight. It's pretty tricky out there with the hot track and ambient temperatures. The long run at the end of FP2 was very encouraging and gives us a direction to go in for tomorrow." Fabio Leimer: "It was very good to get my first FP1 opportunity with the team and my thanks to them for doing this on a difficult weekend. I was pleased that I was able to get up to speed quite quickly. The car felt good and it was nice to make a very hands-on contribution to the start of our race weekend in terms of feedback to help the team move in a good direction. It's good to be back at the wheel of a racing car again." John Booth, Team Principal: "The past few days have been extremely difficult for our team members, but I am very proud of the way everyone has balanced the enormous sense of loss with the focus required for the start of a Grand Prix weekend. As sad a time as this is for all of us, we have countless happy memories of Jules and remembering those incredible times we shared together is helping us through. One such happy memory is in fact from here at the Hungaroring last year, where Jules had a fantastic qualifying session with an incredible lap securing Q2 contention and an eighth place grid slot. As for this weekend, credit to Roberto, Will and Fabio for two very positive sessions, which have created a solid baseline from which I am sure we can make good progress." Felipe Nasr (14th, 1:26.379): "In the morning we mainly tested different set-ups on the car. We seemed to struggle a bit on the medium tyres, however, I believe we made the right changes for the second free practice. I am satisfied with the balance of the car, therefore, I think we are going in the right direction. We know that the grip level can change from day to day, so we need to keep that in mind. Due to the heat, the Hungaroring is always a challenging track in regard to the tyre management." Marcus Ericsson (16th, 1:26.831): "Track temperatures around 50 degrees made it difficult to keep the tyre temperatures in the right window so that they did not overheat. During the second free practice we tried different set-ups to optimise the balance of the car. I think we have learned some good lessons for tomorrow. I am not entirely satisfied with the afternoon session, because I didn't have a clear lap on the soft tyres. Overall, the performance today was more or less what we expected."